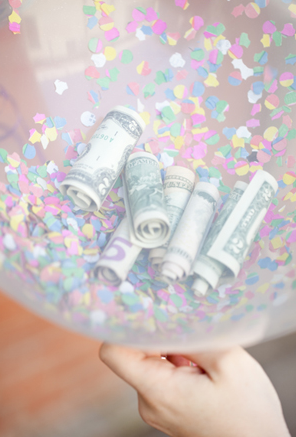 We fell in love with the idea of hiding money in balloons with this fun birthday box idea, but if your gift is going to be hand delivered instead of shipped, why not use a little helium and a lot of confetti to dress up these fun money balloon gifts. You can read all the handy tips for making money balloons over at Sugar and Charm. Great idea! I am always looking for ideas to give money for a gift. It makes the gift more interesting! Fun idea! Thank you so much for sharing! Great idea - as long as no one lets go of the balloon! Love this idea - as long as no one lets go of the balloon! I did this for various graduation gifts -- tied the balloons to a small dowel to make a bouquet, for a stuffed bear to hold. . . also gave the grad a small box containing a large safety pin, and a note that said "Let the party begin!"